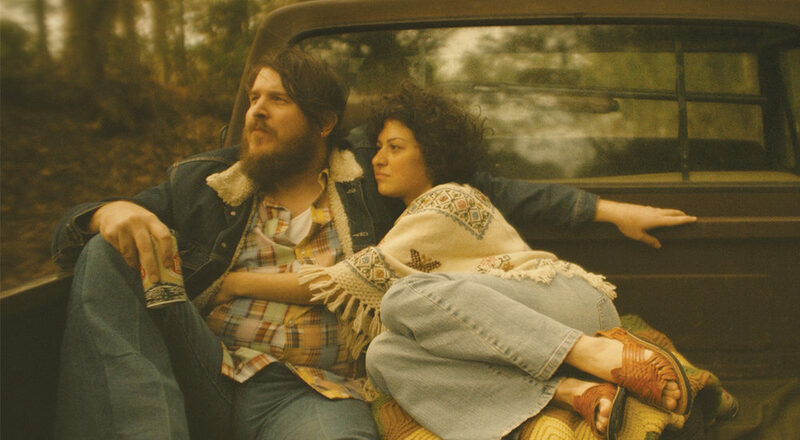 Ethan Hawke's 'Blaze' celebrates the life and times - and music - of an unsung country hero. For every country music star, there are seemingly a dozen anonymous artists of whom the general public have never heard, but have had massive influence over their peers. Blaze is a movie about one of these unsung modern country pioneers. Blaze stars Ben Dickey (himself more of a country/folk musician than an actor) as Blaze Foley, a talented-yet-tortured singer songwriter from Arkansas. The movie covers his early life and the meeting of his soulmate Sybil Rosen (Alia Shawkat from Green Room), the move to Austin to pursue his music career, and the personal demons that took a toll on both his personal and professional lives. With respect to the material and timeline that it covers, Blaze is a standard biopic. But Blaze‘s presentation is anything but standard. Director Ethan Hawke (yes, THAT Ethan Hawke, from First Reformed and The Purge, who also co-wrote the screenplay with the real-life Sybil Rosen, basing it on her book Living in the Woods in a Tree: Remembering Blaze Foley) takes the unique approach of telling Blaze’s story from three different viewpoints. One timeline shows Blaze as a young artist, and concentrates on the events of his life. Another shows him in the twilight of his career, recording all of his songs in a dive bar one night and telling all of the stories that go with them. And a third sees his close friends Townes Van Zandt (musician Charlie Sexton, who also had a role in Boyhood with Hawke) and Zee (Josh Hamilton from Eighth Grade) telling tales during a radio interview about the man after his death. It’s a fascinating way to get three unique versions of the events; as they happen, as they’re remembered by Blaze, and as they’re remembered by those who loved him. And Blaze does have a fairly eventful life, so seeing it from the differing angles puts it all in perspective, for both the viewer and the characters. At a bit over two hours, it does get long winded, but that’s to be expected from a movie that was such a passion project for its director; Blaze is obviously a film into which Hawke obviously poured his heart and soul, so no one can blame him for not wanting to leave much on the cutting room floor. And, to the movie’s credit, it’s never boring, just a bit fluffed up in places. Speaking of Hawke’s passion for the project, the director called in some old friends for the film, so Blaze is packed with familiar faces in bit parts. Wanting Blaze’s family to be played by actors who are also musicians, Hawke cast country music legend Kris Kristofferson as his father and Hurray for the Riff Raff singer Alynda Segarra as his sister. A trio of businessmen who offer Blaze a deal is portrayed by Sam Rockwell (Three Billboards Outside Ebbing, Missouri), Steve Zahn (Lean on Pete), and Richard Linklater (Hawke’s director in Boyhood). Hawke even gets into the act himself a little by playing the part of the off-screen radio interviewer (he’s never shown, but his distinct voice gives him away). Between the performances of Ben Dickey and Alia Shawkat, Blaze doesn’t need the starpower, but it’s fun to see Hawke’s people showing up just the same. In the end, Blaze is a well-made biopic about a flawed genius who keeps trying to deal with those flaws. The real Townes Van Zandt once said of his friend “he’s only gone crazy once, and he decided to stay.” That pretty much sums up Blaze – both the man and the movie. To make sense out of his non-linear vision, Hawke enlisted the help of editor Jason Gourson, who also cut Bucky Larson: Born to Be a Star (but don’t hold that against him). Gourson seamlessly weaves the braided, three-part narrative into one coherent story that lets the past, present, and future each have their respective say. For instance, Blaze might introduce a song in the present, then the film will wander back to when he was inspired to write it, and finally, Townes and Zee will toss in an anecdote or two in retrospect. Narratively, Blaze jumps around a lot, but it’s never hard to follow, thanks in part to the changing lengths of Blaze’s beard (the same technique was used to keep timelines straight with Don Cheadle’s hair in Miles Ahead), but mostly because of Jason Gourson’s flawless editing. A biography about a musician is only as good as its music, and luckily for Blaze, its soundtrack is tops. Ben Dickey does his own singing of Foley’s songs in the film, and while he is a more musical vocalist, he still lets some of Foley’s rawness and emotion shine through on songs such as “Clay Pigeons,” “Baby Can I Crawl Back to You,” and “I Should Have Been Home With You.” Alia Shawkat joins him on songs like “Cold, Cold World” and “Oo-De-Lally,” adding a sweet and pure harmony to his grizzled melodies. Of course, Charlie Sexton does his own singing on Townes Van Zandt’s music as well, including “Blaze’s Blues,” a tribute to his fallen friend. Blaze is one toe-tapping hit after another, and each song is an integral part of the story. Most importantly, Hawke lets his cast perform Foley’s tunes themselves, giving the movie its own musical voice, even though it’s singing the same old songs.